This book is original in its conception, perspective and treatment of the languages and identities of the West Indies as a whole. Peter Roberts makes extensive use of a huge range of multiple and multilingual historical sources to let the voices of the past speak for themselves, and unearths forgotten connections that reveal the interrelatedness of territories and their 'historical saga'. 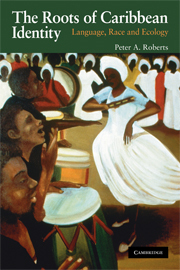 The Roots of Caribbean Identity: Language, Race and Ecology presents a lucid account of a movement from a written, wholly European construction of Caribbean identity towards a more Caribbean one and relates how the identity of the Caribbean region and the identities of the separate islands within the region were shaped, set out within a chronological sequence starting from the time of the European encounters with the Amerindians and finishing at the end of the nineteenth century. Central elements of the title are race, place and language which are seen as a basic starting point for the constitution of identity. Written by a key and trusted author. Winner of the Gordon K. and Sybil Lewis book award. Extensive use of historical resources. Illustrated and has at its central elements race, place and language which are seen as basic starting points for the constitution of identity. Presents a lucid account of a movement from a written, wholly European construction of Caribbean identity towards a more Caribbean one.